My latest dress commission for a client in Paris. The fabric is vintage Yves Saint Laurent silk. I recently did a photo shoot in Paris with the photographer Vivienne Mok. 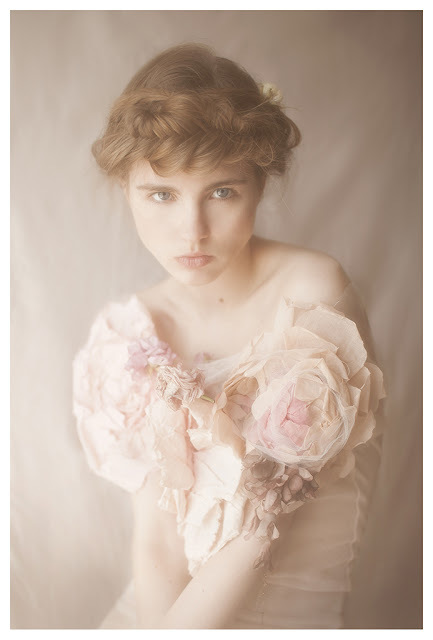 I used the toiles from my Paradise Lost collection and added hand made flowers made from calico and tulle. On Wednesday 8th May I'm taking part in a charity fashion show organised by LCF students, which aims to raise money for the Rehema project and also to raise awareness around the issues of ethical fashion. I have contributed six dresses to the show including this one. The event is being held on Wednesday 8th May 2013 at 7pm at St Pauls in Hammersmith W6 9PJ. Tickets are available on the door and include a free drink, with all the proceeds going to Rehema. Tickets are £10 or £7 for students. Read about the Rehema project on the fundraising page HERE. View the facebook page HERE.